The Jam offers infinite height adjustability at a price to suit any budget. 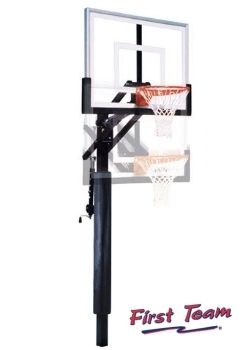 First Team's Jam basketball system includes our heavy 11ga. 4"x4" post design that eliminates the risk of joint deterioration common with sectional type posts. Our spring-aides EZ-Crank� allows effortless rim height adjustment anywhere from 10' down to 7'. The rim height indicator located on the back of the unit accurately shows rim height. Every Jam package comes with a Lifetime Limited Warranty.